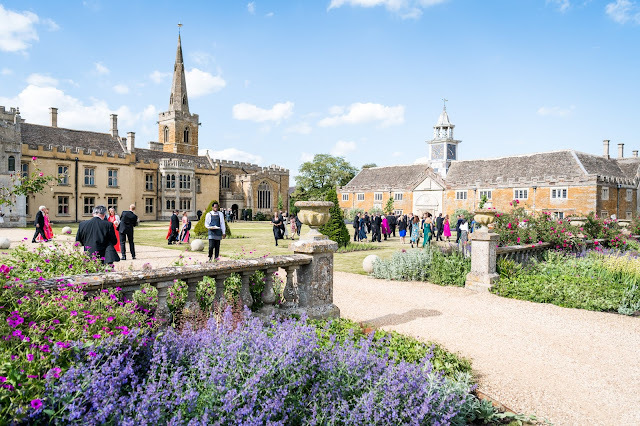 Themed collection of motets and anthems seem all the rage at the moment for CDs from choirs such as those of the Oxbridge Colleges. 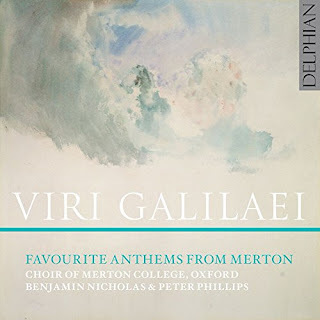 For the latest disc from the choir of Merton College, Oxford, entitled Viri Galilaei, we get a collection of what are described as Favourite Anthems and indeed the collection does include some of the most beloved anthems along with a couple of more unusual contemporary pieces. Conducting honours are shared between Benjamin Nicholas and Peter Phillips with a selection of pieces by Jonathan Dove, Thomas Tallis, Edward Elgar, Thomas Morley, John Rutter, Hubert Parry, William Byrd, Roger Quilter, Gerald Finzi, William Harris and Patrick Gowers. Organ duties are shared between Charles Warren and Peter Shepherd. Jonathan Dove's Te Deum is relatively new, it was commissioned for the new Merton Choirbook, but it seems set to become a modern classic. 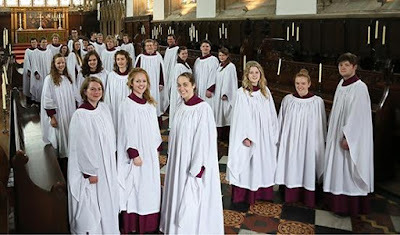 Starting from a virile choral unison, Dove uses the combination of a choir building from unison with rich organ accompaniment which is beloved of composers for the Anglican liturgy. Here Dove's lyrical music over the pulsating organ gives some lovely textures full of a clear sense of Dove's musical personality, and the texture magically thins towards the end. With one except, Peter Phillips conducts all the 16th century items. He and the choir give a simple but effective account of Tallis's If ye love me with a great sense of flowing line. Elgar's Give unto the Lord was written in 1914 and sets words from Psalm 29. A lot of Elgar's sacred music derives from the earlier part of his career, but this is big bold mature Elgar with a great sense of nobilmente, yet subtle and flexible too. Whilst we get a full bodied performance from Benjamin Nicholas and the choir with Charles Warren on organ, there are some lovely intimate moments too. Peter Phillips and the choir give a very elegant account of Thomas Morley's Nolo mortem peccatoris, not a Latin anthem but a setting of a macaronic text by John Redford. The choir brings out the expressive melancholy of the piece, singing with great purity of timbre. John Rutter's The Lord bless you and keep you, setting a text from Numbers used at Evensong, is small but perfectly formed; a lovely tune perfectly evoking a sense of the evening coming. Hubert Parry's Milton setting Blest Pair of Sirens is on a far bigger scale, with Charles Warren accompanying on the organ and impressing with the lovely prelude. Given the size of the choir (28 young voices) this is quite an intimate performance, often chamber-like but there is innate strength in the singing too and a really rousing conclusion. It is Benjamin Nicholas who conducts Byrd's Diliges Dominum in a performance notable for the smoothness and transparency of the texture, though I would have liked more words. Roger Quilter's Lead us heavenly Father has rather a hymn-like quality to it in the first verse, but the second is for just tenor solo (Oliver Kelham) and organ (Peter Shepherd) whilst the final verse gets more complex mixing all these ingredients together. Then Peter Phillips conducts a poised and beautifully elegant account of Thomas Tallis's O nata lux. Gerald Finzi's Lo, the full, final sacrifice is the largest piece on the disc. 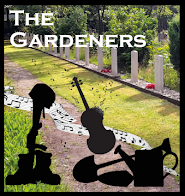 A setting of Thomas Traherne, at over 15 minutes long this is far more than just an anthem. Charles Warren provides the complex organ accompaniment whilst Francis Shepherd and Thomas Herring provide the fine tenor and bass solos. There is a rich complexity to the work with a lovely fluid performance from the choir. They give a shapely sense phrase, but clarity of the words is sometimes compromised in favour of a fine line. William Harris's Faire is the heaven, a favourite with many choristers, is sung with great beauty of tone and a lovely transparency of texture in a very refined performance. The last work on the disc is Patrick Gowers Viri Galilaei, setting words for the Feast of Ascension it uses choir and two organs though here we have both Charles Warren and Peter Shepherd playing the Merton Chapel organ. It moves from a richly mystical opening, through to a virile climax and a concluding hymn decorated with a propulsive organ part but ending on a highly mystical note. 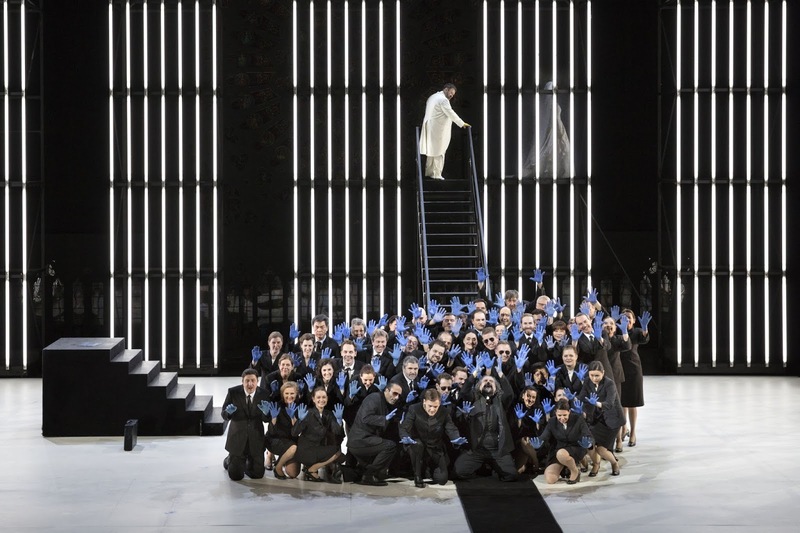 A brilliant musical evocation of the Ascension. This is an attractive collection, well sung. 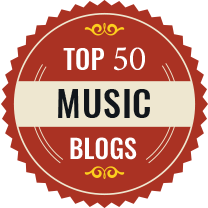 Admirers of the choir and those looking for an interesting selection of choral music need look no further. Recorded 28-30 June 2016 in the chapel of Merton College, Oxford.